2013’s Tomb Raider reboot was the biggest success for the long-running series in quite some time. Reinvented as an action-packed, cinematically influenced romp with bombastic set-pieces, bone-shattering deaths, and a surprising amount of chilling horror, it set the bar high for any sequel. 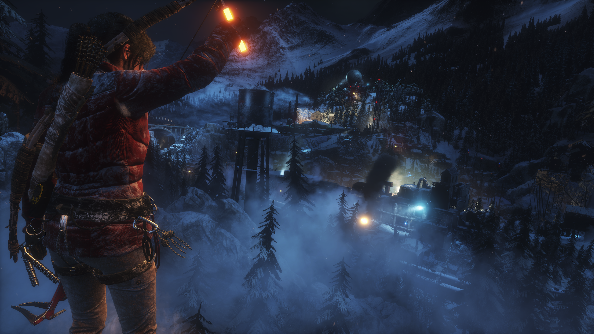 Rise of the Tomb Raider hikes its way up the mountain of expectation and bypasses that bar, leaving it behind under the fogs of high-altitude. You look like a person of opinions – come share your thoughts in our Rise of the Tomb Raider user review. 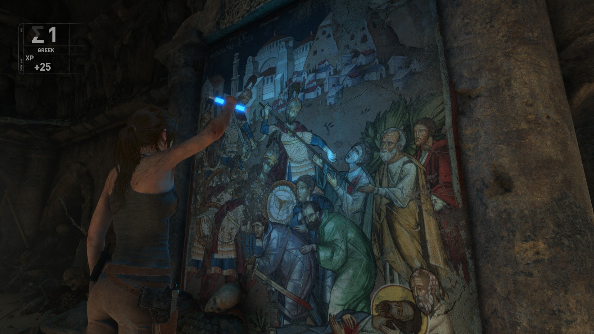 I adore Rise of the Tomb Raider. Crystal Dynamics have crafted an exceptionally strong sequel. It frequently steals breath with astonishing vistas and visuals, and causes the heart to hammer as cliff-faces and architecture crumble beneath your fingertips. Plus, in a truly welcome return to its roots, it also introduces grey matter workouts in the form of majestic, puzzle-laden tombs. In almost every way possible, Rise of the Tomb Raider builds upon and improves the elements that made up its predecessor. We rejoin Lara a few years after her terrifying ordeal on Yamatai, now a competent archaeologist continuing the work of her late father. The case to be solved is that of The Divine Source, aka the key to immortality. 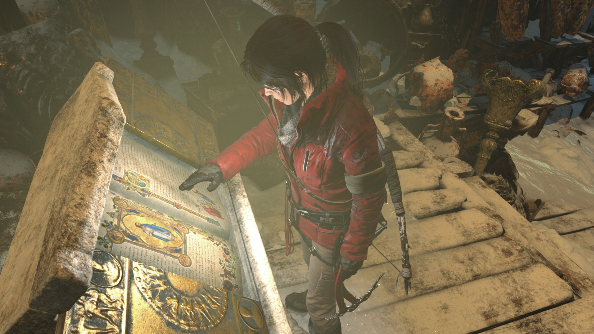 The artifact has long been sought by Knights Templar-like evil society Trinity, so Lara needs to race through clues and leads to get to it before stomping military boots do. The result is a globe-hopping adventure like the Tomb Raider games of old, visiting locations as wildly varied as Syria and Siberia. Your journey through each location can be broadly split into two styles: cinematic, linear sections where things are exploding and/or collapsing wholesale, or vast open spaces that are practically verging on being open-worlds. If you’ve played the previous game then you know what to expect from the former: they’re packed full of excitement, with sequences to make your head spin, and reliant on quick reflexes for when the floor inevitably gives way beneath Lara’s feet. They also act as a real work-out for Lara’s skill set, requiring you to link together ziplines, grapples, and multiple murder moves in astonishingly quick succession. It’s the open areas that are Rise’s new contribution, and they’re really something. Beyond just being beautiful landscapes ranging from forests to Soviet installations, they’re overflowing with things to find and do. Treasures lie buried beneath soil and hidden in nooks, runes are etched into walls begging to be translated, and windchimes tinkle at the entrances to tombs. These hub worlds are real playgrounds for collectors and completionists. Importantly they don’t feel like similarly built regions in other games. Whereas in Assassin’s Creed you feel like you’re ticking off a checklist of dots on a map, Rise of the Tomb Raider has a genuine sense of discovery. Instead of flicking between a map and the world, you’ll be scouring the locations with your own eyes, making sense of the game’s subtle environmental signposting to find every last corner and its secrets. The game makes you feel like a real archaeologist, and that’s its biggest achievement. Discovering a tomb on your travels is where this feeling most comes alive. After a while you’ll begin to see the signs in the environment that indicate that one is near, but when I saw my first tomb I didn’t actually realise it was one. It was only when I found a crossing to it that I discovered the awesome thing in the background (I won’t spoil the moment for you) was actually something I could climb into. Such moments are all too rare in games, so this one has stayed with me. Not only are the tombs truly enchanting in visual design, but also in their construction as puzzle chambers. Once again Crystal Dynamics have made a Tomb Raider game heavy on the combat and brutality, so it’s a welcome change of pace to head into an abandoned crypt and spend some time away from gunfire; you’ll never find a thug patrolling inside. Instead, you’ll be confronted by puzzles that range from simple ‘do-this-to-open-that’ tasks to large, multi-tier cause-and-effect conundrums. For the most part physics are your adversary, and it’s through clever use of water and weight that you’ll be solving the ancient mechanisms that will reveal your prize. When you’ve had your eureka moment and realised what needs shoving or winching to unlock the final obstacle, you’ll be invited into the treasure room. Rather than just offering up a bumper crop of scrap materials to use in the crafting system, Rise gifts you with something much more special: skills. They’re all based on ancient civilization techniques, such as holding arrows in your bow hand for quicker re-notching than reaching for a quiver. 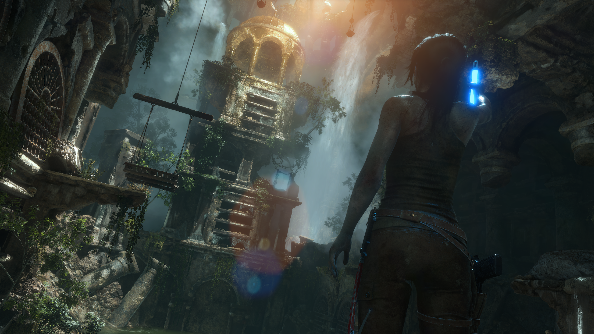 It means that the more tombs you find and conquer, the more powerful Lara becomes. As they’re an entirely optional element of the game, these great rewards are just the enticement you’d need to want to seek out every one. The quest to complete every tomb creates a distinct amount of backtracking. Every area you visit, right from the very start, has sections that can’t be accessed due to the equipment you carry. 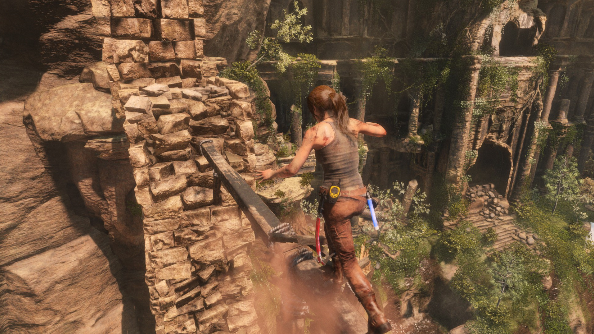 Some gates are heavily barricaded and need rope arrows to wrench them apart, while other entrances may be too high up for Lara to reach without her grappling hook. For completionists, a variety of collectables in each zone will require advanced gear too, so there’s multiple opportunities to scour each area when you’ve gained new toys further into the journey. Fortunately for a game with so much encouragement to return to previous areas, the fast-travel camps are numerous and keep tiresome trekking to a minimum. Should secret tombs and backtracking for collectables not interest you in the slightest, that’s perfectly fine. For those just concerned with pushing onwards, the main story provides you with all sorts of fun weapons and hand-crafted gadgets to experiment with. There’s opportunity to gain non-essential gear through the completion of side-quests in the hub worlds, where you can help out NPCs in an almost RPG fashion. That RPG feel continues in the experience system, which once again builds upon what the first game provided. There’s a huge set of abilities available in the three skill trees, allowing you to make Lara a more proficient adventurer as you gain points for finding treasures and brutally murdering men. 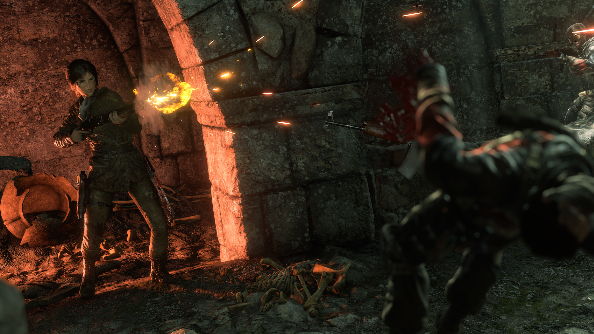 The combat is as swift and violent as it was before, although solid efforts have been made to allow Lara to be a little sneaker in her approaches. It’s not true stealth, but a welcome new tool in her armoury. The survival game-like crafting system makes a return, but rather than the single ‘scrap’ currency things are a little deeper this time. Wood, feathers, scrap, and various furs are the components needed to improve and upgrade weapons, so there’s a little more seeking and hunting required. Weapons no longer simply magically upgrade into different variations when enough upgrades have been applied: Lara will now have three different versions of her bow, pistol, assault rifle and shotgun; each with various stats, strengths, and weaknesses. It adds a welcome element of tactical choice, demanding assessment of the situation ahead and deciding which model will be of the most use. For all its gameplay strengths, where Rise of the Tomb Raider stumbles and scrapes its knees is in the story department. Rhianna Pratchett is back on narrative duties, and while it nicely touches on Lara’s relationship with her father and her step-mother, this feels a distinctly less human story than her adventure on Yamatai. Where the first game saw strong bonds formed with friends who aided, sacrificed themselves for, and betrayed Lara, Rise has a plot that much more strongly resembles the traditional Tomb Raider tales of old. The reboot wonderfully surprised us with it’s great use of horror, and it’s a shame there are no interesting genre twists here. It’s never to the game’s detriment though, because Rise of the Tomb Raider is all about the struggles of expedition and the thrill of adventure. When you’re tethered to the side of a frozen mountain, ice cracking beneath your pick and bitter winds howling around your ears, you’re not going to care that the story treads an all-too-familiar path. Better than almost any other game out there, it captures the energy of climbing a mountain, and then falling off it and crashing through a thousand sheets of ice and rubble. It may not be realistic in the slightest, but it feels oddly authentic. The story campaign is the majority of the package, but there’s also Expeditions mode, which is an interesting little experiment in league tables and challenges. You can replay any level of the game, and modify it with a series of playing cards that you can earn in-game or buy with real money. These modifications range from increasing the difficulty to offering weapons you wouldn’t normally have, and add or deduct points to your score based on their effects. Depending on the version of Expedition you play, the game will also be littered with ‘90s platformer-style gem pick-ups and massive bonuses for killing x amount of enemies and not dying during the playthrough. For the competitive among you, it’s a good chance to show off to your friends and the world just how incredible you are at causing the destruction of irreplaceable ancient cities. We’ve a more detailed breakdown in our Port Review, but Rise of the Tomb Raider runs beautifully on PC. I’ve been playing the game on slightly older hardware, and yet the game’s gorgeous worlds and characters have been pushed out at frame rates in the mid-50s with no hassle at all. I played Rise of the Tomb Raider back in November on Xbox One, and it looks astonishing on that platform. Obviously the PC version has an edge, and that’s mostly felt in the frame rates. PC players are getting a significantly smoother experience. Also, thanks to higher monitor resolutions (I run at 1200p) you get to see a little extra detail in those textures, which are especially sharp here. The game also feels perfectly at home with a mouse and keyboard set-up. 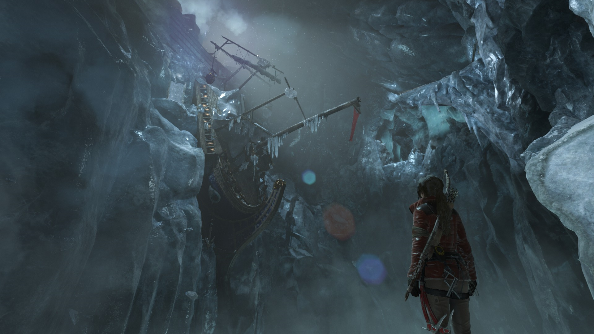 Rise of the Tomb Raider is not a brave sequel, but it never needed to be. While there are sizable differences between it and its predecessor, they feel like the natural evolutions of the formula. But what it does do is take those concepts and run with them to heights you wouldn’t have expected. It blends the freedom of open environments with the purpose and direction of a linear adventure, and packs every corner with something new to discover and thrills to enjoy. It’s the very definition of the classic ‘bigger and better’ tag line. Regardless of if you’ve played the first game or not, Rise of the Tomb Raider is a journey you should embark on. Few games offer thrills in such a well-crafted, honed package. There’s simply not a single moment when the game doesn’t feel like it’s not giving its all. Rise of the Tomb Raider truly makes you feel like Lara Croft: a bow-wielding, mountain scaling, bear-slaughtering, cave diving mad lady with more curiosity than can be healthy. And that feeling is just wonderful.